Dennis Hopeless and Victor Ibenez’s Jean Grey is a thoughtful, nuanced exploration of anxiety, self-doubt, and fear. Teen Jean’s been preparing for the Phoenix’s return—the test of her life—but this week, the Phoenix decides that it’s tired of waiting for her to study up. Reckoning day’s here. Though she is a vastly different person than the adult Jean Grey that we traditionally think of (who has been dead for quite some time in the comics), Teen Jean Grey (from the past) has accepted that she is fated to one day inherit the Phoenix Force from her future self. After summoning up the courage to embrace her destiny, Teen Jean’s been spending time with other powerful psychics and beings who’ve had brushes with the Phoenix in the past—hoping to arm herself with enough knowledge to contain the Force when they connect. As helpful as studying with Doctor Strange, Psylocke, and the Scarlet Witch has been, it’s being literally haunted by the ghost of her future self (don’t think about it too hard) that’s proven to be the most enlightening experience so far. Together, they discovered a small fragment of the Phoenix Emma Frost hid within her own psyche after having been possessed by a fifth of the Phoenix during Avengers vs. X-Men. Ghost Adult Jean convinced her younger self to touch the fragment, causing the younger host to slip into a coma and begin violently seizing. The plan, Ghost Jean explains, was to “inoculate” Teen Jean to protect her against the full Phoenix. The blistering tension fueled by Jean and Emma’s longstanding rivalry is palpable in their interactions as they rush a convulsing Teen Jean to the hospital in an ambulance, but there’s something more there. Emma and Jean aren’t really taking verbal jabs at one another because they want to fight, but rather because they’re scared. Ghost Jean knows she messed up and Emma knows that she probably would have done the same thing if given the choice. As a fleet of regular doctors swarm and triage Teen Jean, Ghost Jean and Emma come to the realization that they’ve both, in one way or another, failed the girl to a point. The two mutant powerhouses’ personalities are brought down to earth and they consider that there’s a chance neither of their plans will work. But they must go on, and so the psychics commandeer a helicopter that Emma begins directing toward the forests in upstate New York. The two frenemies use the time during their flight to discuss why Emma would be so foolish as to keep any of the Phoenix inside of her, and Emma’s honest—she wanted to keep just a taste of that addictive, corrupting power. Before Jean can ask her more, Emma announces that they’ve arrived at their destination—a secluded glen in the forest where the three remaining Stepford Cuckoo sisters are waiting for them. The sisters are willing to momentarily set their grudge against Emma aside to help perform a psychic exorcism on Teen Jean to remove the Phoenix shard from her mind. The gravity of the scene makes it clear that the small piece of the Phoenix that’s within Jean is nothing compared to the full entity. The group of psychics are barely able to wrest the Phoenix from the teenager until Quintin Quire shows up, pulls out a psychic handgun, and shoots teen Jean, putting her into yet another psychic coma and cutting the Phoenix off from tapping into her power. Just as it seems like the situation’s been neutralized, Hope Summers—Cable’s daughter from a future apocalypse—shows up riding a flying rocket cycle with a warning: she’s seen the Phoenix Force heading straight for earth. In the sudden wave of confusion and panic, no one notices that Teen Jean’s woken up with a bit of news of her own. The Phoenix isn’t coming; the Phoenix is already there. 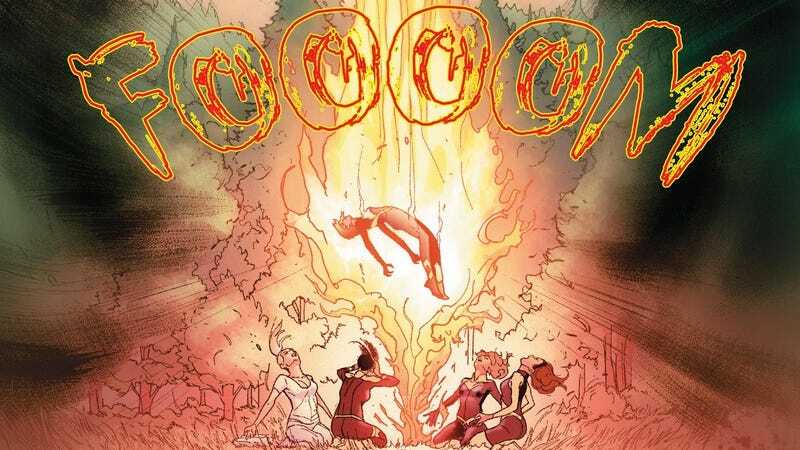 As an individual issue, Jean Grey #9 is noticeably more fast-paced and flashy than its predecessors, but the drama and theater of it all feels like the perfect way to set up Resurrection, the big event that will see Adult Jean brought back from the dead. So far, Jean Grey’s consistently managed to riff on its titular character in new and creative ways that make her feel fresh and unburdened by the weaknesses of Phoenix stories past. Let’s hope Resurrection keeps within that tradition when it begins later this year.